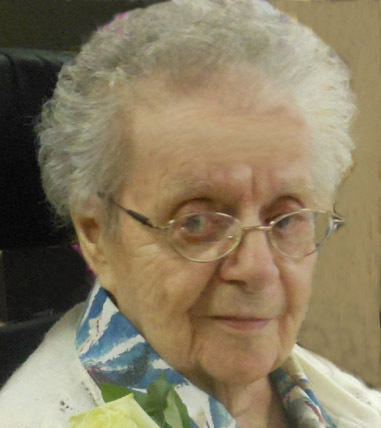 Anna R. (DiGiovanni) Ohotnicky, 98, of Torrington, CT, passed away Saturday, March 24, 2018, at Charlotte Hungerford Hospital. She was the wife of the late Andrew (Bob) R. Ohotnicky, Sr.
Anna was born May 6, 1919, in Torrington, CT, daughter of the late Donato and Rose (Chieffo) DiGiovanni. She was employed by the Fitzgerald Manufacturing Company and then as an assembler of the Torin Corp, Air Impeller Division until her retirement. A communicant of St. Peter Church, she was also a member of the St. Peter Holy Rosary Society. She is survived by one son, Andrew R. Ohotnicky, Jr. and his wife, Kristine, of Torrington, CT; a brother, Daniel DiGiovanni of Torrington; one granddaughter, Andrea Ohotnicky-Yeomans and her husband Mark, as well as several nieces and nephews. She was preceded in death by three brothers, Carmen, Patsy and Louis DiGiovanni, and two sisters, Teresa Basso and Mary Ur. A Mass of Christian Burial will be celebrated on Wednesday, March 28, 2018, at 11:00 a.m. at St. Peter Church, 107 East Main St., Torrington, CT 06790. Burial will follow at St. Francis New Cemetery. Relatives and friends may call on Wednesday morning from 9:30 a.m. to 10:30 a.m. at Cook Funeral Home. We would also like to thank the staff at Litchfield Woods and Charlotte Hungerford Hospital forth floor for the care that was given to Anna.